PandaTip: This contract template can be customized in seconds, thanks to PandaDoc’s token fields. Simply fill out the tokens in the menu on the right to add key information throughout the template! PandaTip: This template’s pricing table is extremely easy to customize. You can add or delete line items, make items required or optional, and allow your clients to edit item quantities to their satisfaction. You can even include discounts. Get started with PandaDoc Contracts today! The above-listed Bride and Groom (the “Clients”) and Photographer (Photographer) agree that the Photographer will provide wedding photography services as outlined in the tables above. This is a legally-binding contract. This contract represents the entire understanding of the requirements, schedule, and payment terms for the wedding photography services listed above. If there are any disputes or actions resulting in legal proceedings related to this contract, such actions shall take place in and be subject to the laws of [Photographer.County], [Photographer.State]..
Clients accept sole financial responsibility for any legal fees or related costs incurred by the Photographer in enforcing the terms of this wedding photography contract. Any failure by one or both parties to uphold or enforce a provision of this contract shall not constitute a waiver of any other provision of this contract. The Clients agree to retain the Photography for the services listed above by signing this wedding photography contract and paying a deposit equal to 25% of the total fee listed above. Clients acknowledge that no reservation can be made prior to the signature of this contract and subsequent payment of the initial service deposit. The remaining balance for the above listed wedding photography services shall be due in full no later than 14 days prior to [Ceremony.DateTime]. In the event that payment is not made in full by this deadline, Photographer reserves the right to terminate this contract, retain the initial deposit, and no longer be held liable for providing further services to the Clients. The Clients may cancel this contract at any time up to 30 days prior to [Ceremony.DateTime]. To do so, Clients must send a written cancellation notice via either email or certified mail. The Clients hereby forfeit their initial deposit in case of cancellation, and agree to pay the full amount for the services listed above should they cancel this wedding photography contract after the date 30 days before [Ceremony.DateTime]. PandaTip: Having your clients initial each page of their wedding photography contract makes them more likely to read the terms they’re agreeing to, so that you don’t have to deal with headaches later on. Client may reschedule the dates of the ceremony and reception listed above no later than 30 days prior to [Ceremony.DateTime] with the written approval of the Photographer. Should the Photographer be unable to accommodate the Client’s rescheduled date, the Clients will not be held responsible for the remaining balance of this wedding photography contract, but will forfeit their initial deposit. If the Photographer should be unable to provide the goods and services outlined in this contract for any reason, Photographer agrees to refund any fees paid by the Client, minus applicable expenses, and shall have no further liability with regards to this contract. This limitation of liability also applies to any loss or damage to footage, photographs or other materials after the events listed in this contract. The sole remedy for any actions or claims resulting from the Photographer’s inability to deliver the goods and services listed in this contract shall be limited to a refund of monies paid by the Client to the Photographer. The Clients acknowledge that the Photographer does not maintain archives of images and footage after delivering requested images and other goods to the Clients. It is the Client’s sole responsibility to request any desired prints, products, or files within 7 days of [Ceremony.DateTime]. Any additional goods or services not included in this wedding photography contract will be sold at then-current rates. Photographer makes no pricing guarantees outside of the terms of this contract, and the Clients acknowledge that prices for additional goods or services are subject to change suddenly and without notice. [Photographer.Name] will be the sole and exclusive photographer for the above listed events. Photographer is responsible for bringing any equipment or assistants necessary to conduct the services outlined in this contract. Clients agree to prevent any other photographers or videographers at the events listed in this contract from interfering with the Photographer’s performance of their duties. This includes wedding guests and other amateur photographers or videographers. Photographer will not be held liable for compromised event coverage due to interference from other parties, including late arrivals by members of the wedding party or their guests. Likewise, Photographer is not responsible for degraded coverage due to environmental issues, such as poor event lighting, space, or backdrops. Client agrees to confirm the event’s date, time, and location no later than 7 days prior to [Ceremony.DateTime]. The Clients acknowledge that they are responsible for ensuring appropriate behavior by their guests, wedding party, and other vendors. In the event that the Photographer identifies any inappropriate, threatening, hostile, or otherwise offensive behavior directed at them, their assistants, or their equipment, Photographer reserves the right to end coverage of the events, retain all fees paid by the Client, and hold no further responsibilities to the Clients. Photographer will provide the goods and services listed in this wedding photography contract, including event coverage for the listed hours at the venues listed. If additional coverage hours are requested on the day of the events, Clients agree to pay the Photographer in full for those additional hours at the hourly rate listed in this contract. Photographer agrees to make every effort to provide satisfactory coverage, but cannot make any guarantees as to specific photos, poses, etc during the event. Photographer will perform limited color correction and retouching prior to delivering any physical copies of images to the Clients. If the Clients request a digital copy of their images, the Photographer will provide three image sets: black & white, original color, and corrected/retouched copies. Photographer is not responsible for the printed copies of images delivered to the Clients as electronic files. The Clients may request additional physical copies of images and footage from the event within 7 days of [Ceremony.DateTime]. This wedding photography contract serves as a model release. This grants the Photographer the right to use all images and footage without restriction for advertising, portfolios, and other lawful purposes. The Clients waive the right to inspect any images produces using the images or footage from the events in this contract, and the right to restrict the use of the images or footage from the listed events by the Photographer. All photographs and footage are and shall remain the sole intellectual property of the Photographer in accordance with United States Copyright Laws. The Clients hereby waive any rights to intellectual property ownership, monetization, or reproduction of the images and footage created by the Photographer, with exception of the terms of any formal written releases provided to the Client by the Photographer. Client agrees not to reproduce or modify the images or footage provided by the Photographer without first obtaining a formal written release signed by the Photographer. Should the Photographer discover any violations to this agreement, the Clients agree to be held financially responsible at a rate of $300 per violation. PandaTip: PandaDoc’s electronic signatures make it easier than ever to get contracts signed. 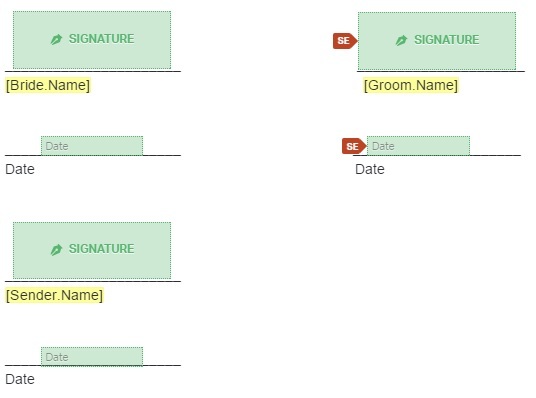 Once you’ve customized this template, your clients will be able to view and sign their wedding photography contract from any computer or mobile device. I have read, understand, and agree to abide by the terms of this wedding photography contract as they are listed above.